Lots of people ask me how I get so much detail into my animal paintings, so I thought it would be helpful to show the various steps that may go in to a painting. 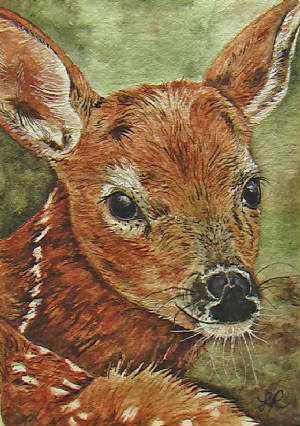 This happens to be an ACEO miniature of a fawn. 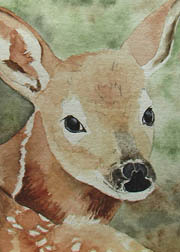 This was my very first time painting a deer, so the process was slow but well worth the wait. 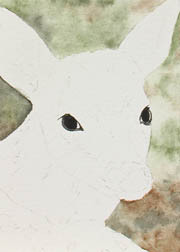 In this first view, I have sketched the deer on the paper. A little bit of the background has been mapped out. I blocked in his eyes, because it is the single most important feature on any animal, and I always work on the eyes towards the beginning of a painting. In the second view, I have added the first washes of color, being careful to leave the paper untouched wherever I feel I may want to keep pure white later. I have now added his nose, which I need painted now to give better form to his face. I have also added some highlighting to his eyes to better explore his character. I have found that once the eyes are perfected, everything else seems to flow from that. In view #4 I have deepened shading in places and begun the detail fur work to his face. 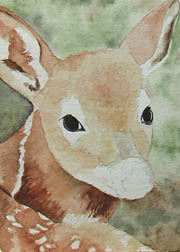 I have also played around with some darker colors in the background. 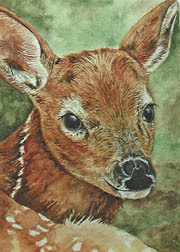 Here in view #5 you can clearly see the detail showing the different directions the fur is growing. More color, especially the darkest colors, has been added to make the lighter colors "pop". 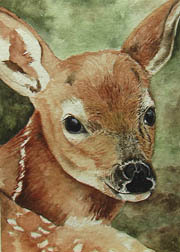 And, finally, here is the finished painting!